I little man loves science so when it came time to plan his 7th birthday party this was the logical choice! It was a hands-on experience from the moment Michael's 10 friends walked in. 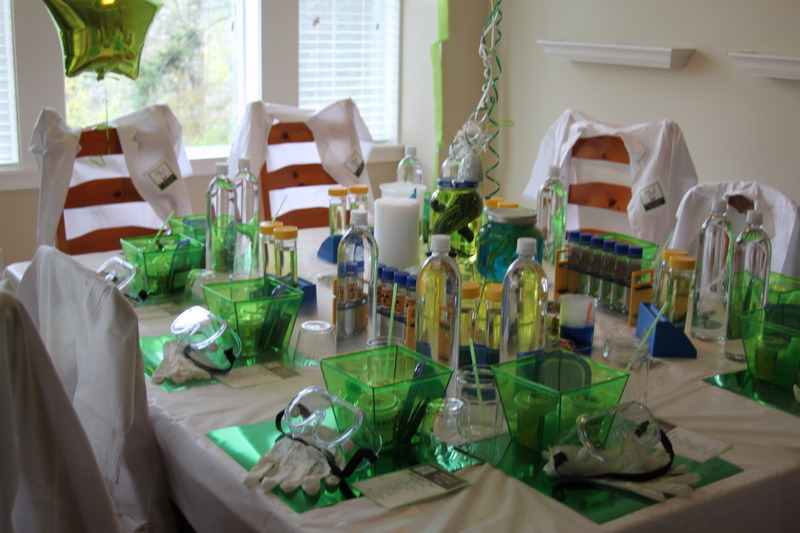 We turned our dinning room into a mad science lab. The boys had a great time and told their mom's it was the best party they've been too. That was quite a compliment! My girlfriend referred me to Cookie magazine's article for a mad science party that ran several years ago. The stevespanglerscience.com website have the article as a pdf for download. That kick started my planning. I used their basic idea and added my own experiments. I ordered all of my experiments from www.stevespanglerscience.com. The petri dishes and beakers came from american science surplus, http://www.sciplus.com. The kids lab coats came from RMF scrubs, www.rmfscrubs.com. I found free clipart for the einstein photo to make my birthday signs. The googles came from the homedepot and I bought green plastic containers in the Target $1bins that worked great to hold the ingredients for the experients. I tried all the experiments first to make sure they worked. I got the ingredients and any containers ready ahead of time for each child at their station to cut down on wait time. I put some of my son's rubber toys in jars I collected from my recycling and added food coloring for the center piece. I bought dry ice for the finishing touch to the beakers so there would be smoke and a bubbling sound during the party. The boys loved it! I made brain cupcakes that I saw on the internet from another mad science party. Those were super simple and made a big impression. my favorite items were the lab coats, badges, and googles the kids wore! So cute and they loved them. I hear from the mom's their kids wear them all the time at home! Search the internet for ideas and inspiration for decorations. The Steve Spangler website is an invaluable source for all of your experiments! It was a must! I had so much fun creating this party and putting it on with my husband for 10, 7 year olds! What a great party it must have been! Very fun pictures. I have never seen any other party with a mad science theme. This one’s a first. And it looks absolutely fun! Not to mention educational in a certain kind of way. This will surely encourage the kids to know more about science and discover new things every day. So fun! This is a kind of party I would definitely throw my kids if they are smart and they love science. I loved science too when I was growing up, and I know I would have enjoyed a birthday party like this! I wish I could have gone to a party like this!! What great fun! Someone essentially help to make seriously posts I might state. This is the very first time I frequented your web page and up to now? I surprised with the analysis you made to make this particular submit incredible. Magnificent process!